Europe and America have their coffee shops. 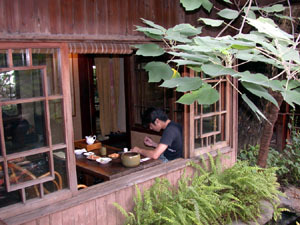 Taiwan, in the Chinese tradition, also has tea houses. Here the solitary poetic spirit repairs to the most old-fashioned of settings to conjure up a Chinese culture and a Chinese mind that is utterly new and has never been before, and yet at the same time is more like what has gone before than anything now existing. The poet -- like the artist, the writer and the true scholar -- knows culture is not some inviolable tradition, written in stone, but an ever-expanding dance of freedom, aliveness and innovation whose aim is to create the better man, the superior person, the truer life. It thrives on freedom from the tyranny of ideas, dogmas and power. It reinvents the present in a way that reconfigures not just the future, but the past as well. History cannot change; but our way of looking at it does. We come to see the past in a different way. We draw new conclusions. On the streets of Taipei today, and on TV screens and front pages around the world, the red shirts are out in number demanding that the President of Taiwan resign because of all the corruption scandals. Who among his loyal supporters down here in the heartland of Taiwan where I live isn't a little bit glad to see the man and his party get this deserved slap in the face. The common people put him and his party in power because he promised to deliver them from the thieving KMT ' not take over their role. 'I feel betrayed,' a staunch Green supporter said to me the other day with a sunken look. That's the general feeling in this part of Taiwan: betrayal, shame, and disgust that the President would let this happen. But let us remember that history may view the events of today quite differently than we do now. I think historians will look back and see that in these times Taiwan was moving towards the future in a radically different way than China. Authoritarianism in China, so long bolstered by aping the outer form of European Communism, now cloaks itself in the outer forms of American Capitalism to head into what promises to be a big, powerful future. China wears the different garment, talks the different talk, and walks the different walk. But the footprints it leaves behind in the lives of its own people show the claw marks of the same ugly beast. Taiwan is different. Not just because of the Green Party, and the indigenous Taiwanese intelligencia and pro-democracy advocates that came together under its banner, but also because of the Blues, and the innocent foot soldiers, thugs, entrepreneurs and bluebloods who gave rise to them. The magic that happened in Taiwan couldn't have happened without both camps. The DPP and the KMT: each played its role. They are the pieces of a whole. In China this whole didn't survive. In Taiwan it did. This is what future historians will see. That throughout Taiwan's long history the island often served as a refuge for that which was hard pressed and on the run elsewhere won't be contested. But whereas present historians stress this as a disadvantage, future ones are apt to see it as a boon. Something got preserved here, something survived, that got wiped out in mainland China. In Taiwan alone the whole of Chinese culture comes forward to meet the present-day world. The seed reached these shores, sprouted, and it grew. The nations of the world make a huge mistake by not noticing this and by failing to admit Taiwan as a full-fledged member of the global community. They also err in not affording Taiwan the umbrella of protection it needs and deserves for its messy and puerile democracy to come to term and give birth to something that has never before existed in Asia ' a Chinese culture that is alive with a freedom commensurate with its genius, and thus a Chinese culture that has been delivered to the source of its real creative power. The crippled beast on the Mainland, masquerading as the 'one' China, bristling daily with more missiles and armaments, is not intact, as its erratic and unpredictable behavior shows. It is a scary threat to global security. The world is too blinded by short-term greed to notice. The very messiness of Taiwan's democracy ' the fact that the issue of official corruption is, for the first time in a Chinese culture, being openly addressed on the streets here, and most certainly in the tea shops also ' is evidence not of Taiwan's failure but of its great accomplishment. No matter which side you're on, Blue or Green, this is obvious. Why it isn't obvious to the red shirts raising such a ruckus in the streets today boggles the imagination. In China, demonstrators like them have been met with tanks and bullets. To even broach the subject of corruption in that country lands one in prison, or worse. Because China is so important to the world, and because in Taiwan alone the whole of it is preserved, this island is a global resource and needs to be protected from the giant on the mainland, at least until which time the rulers there learn how to let China be free, how to let it be alive, and how properly to relate to it, its traditions, and, most of all, its people -- especially those brave souls who dare speak the truth. These don't belong in jail. China desperately needs them in its tea houses, where they can happily write their hearts out like they do here in Taiwan.